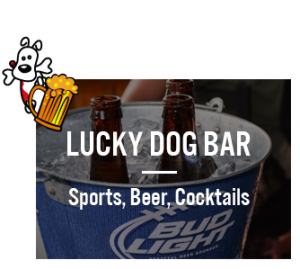 Lucky Dog: Sports Bar, Indoor/Outdoor Dog Park, Boarding, Daycare & Baths too! The area’s only indoor/outdoor dog park with a sports bar where both you and your dog can play. THE BAR IS OPEN TO ANYONE 21 AND OVER (FURRY CHILDREN ONLY PLEASE). Even if you don’t have a dog but you love them, we encourage you to come play and watch the fun! All pups that come to play at the bar must be fixed, friendly and up to date on all shots. We also offer Daycare, Overnight Boarding and Baths 7 days a week. 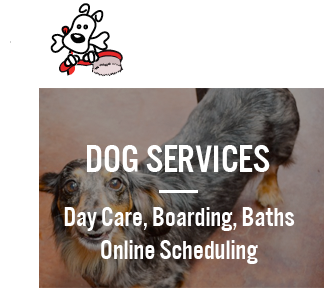 At Lucky Dog, we understand that many families have busy schedules so we make it very easy for you to pick up whenever convenient. Drop off times vary depending on the location but you can pick up as late as 9pm 7 days a week. 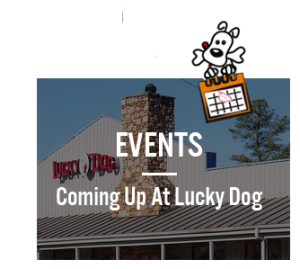 Lucky Dog Bark and Brew is perfect for any dog lover. You don’t need a dog to join in the fun, just MUST Love Dogs! BIG NEWS! Lucky Dog is growing. Our third location in the Steele Creek area is now open, plus we also offer Franchise Opportunities! Click here to learn more.